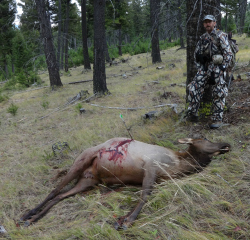 Blood Trailing Elk After the Shot: The Hunt May Not be Over Yet! Blood trailing a mortally wounded elk can create both anxiety and excitement. A concern about possibly never finding the animal hounds you until you see that still brown lump on the ground, or the sticks that suddenly reveal themselves to be antlers. If a good shot is made and a good effort is put into blood trailing, anxiety turns to exhilaration and is followed by elated celebration and gratitude. A lung-shot blood trail will be pinker and may be frothy. It is the rule, rather than the exception, that an elk or deer will run a short ways after being lung shot. They will often run briefly even when shot through the heart. Heart shot blood will be dark red. I have tracked mortally wounded elk through snow with no blood in the snow until they dropped dead a couple of hundred yards away. No blood does not mean no hit! Be prepared to track your animal after the shot. Don’t be disheartened if it immediately runs out of sight, as if it is in perfect health. It happens all the time. Always assume you have hit the animal! Don’t take the chance of wasting such a fine animal and all the work it took to get the shot. It might be just over the hill, piled up. But it might go a half mile and then die. Do the right thing and spend the time to be sure. When I shot the elk to the right I lost track of it amongst the rest of the herd. The whole herd disappeared out of sight behind some trees. I waited a full half hour before quietly stalking up to where I had seen it last. There was no blood, only tracks from the whole herd. I might have followed the herd's tracks if I had not seen trees shaking in a thick jack pine stand. Although, I might have picked up on the lone tracks into the brush. I waited until there was no more movement and stalked to where the trees had been moving. If the downed elk had not shaken the little trees, I would have had to scour the thick areas around there to find it, probably after I had followed the elk herd a while. It wouldn't have been the first time that happened. If you see your animal go down, give it time to die right where it is. Wait to make sure it’s dead. 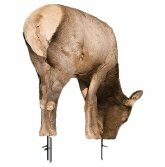 It’s very possible to walk up on an animal that looks dead and have it bolt when you walk up. 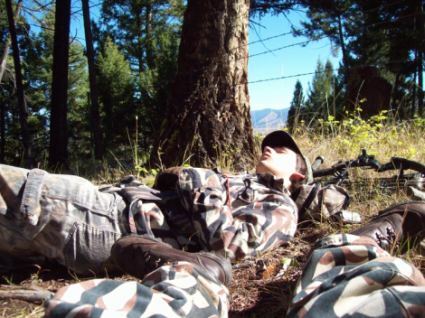 The rule of thumb is to wait at least 30 minutes after shooting a deer or elk before approaching it, even if it looks “for sure” dead. There are plenty of important things you need to do beforehand anyway. Celebrate for a few minutes, without taking a chance of spooking an animal that might still be capable of renewed life. Let time work for you. Use your binoculars to look for breathing. If it isn’t moving or holding its head up, prepare yourself and your gear. Get something to eat and drink. You’re going to need the nourishment. I usually take some time right then and there to thank God for the blessing. If no movement has occurred for at least thirty minutes and you’re pretty sure it’s dead, approach with gun loaded or arrow nocked and ready. As you get closer, use your optics to continue to check for chest movement, indicating breathing. When you reach the elk, touch an eyeball with the barrel of your gun or bow limb. Or, just tap it on the eye with your boot. If the animal is lying there looking around, be patient. Don’t alert it to your presence. A wounded animal would prefer to just lie there, relaxed. Let it. Let time take its toll. Hopefully, it will be bleeding to death (internally or externally). 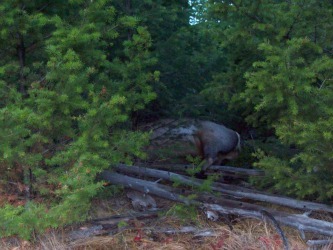 The good eatin' cow elk in the photo was arrowed at 55 yards, using my 60 yard pin. It was five yards closer than I thought. The arrow hit high and to the left a bit. She was standing quite still, so the shot was not as risky as it would have been. The arrow went through the top of the lungs. Since she was left undisturbed, she moved a few feet and bedded. After 45 minutes she died just a few feet from where she was hit. This elk would have been able to run, if impatience had taken over the shooter. A lot of movement, or even a second shot may have been all it took to send her fleeing before she bled to death. If it’s standing there, or if it stands up, take another shot if a good one is open to you. As a general rule of thumb, if it’s still standing keep shooting as long as you have a clear target, especially with a rifle. With an arrow, if you think the first shot is going to anchor the animal, sit tight and don't alarm it with a second shot, unless you have a very clear sure shot placement opportunity. If you think you might have a gut shot animal, be even more patient. Blood trailing will be different. It will be tempting to do something to find this animal. Find something else to do. Take a nap, eat lunch, read a book... Just wait! 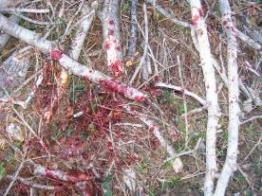 The blood trail will often involve spots of smeared blood as a part of the gut is dragged over logs, sticks or the ground. Give it at least four hours before starting to track the elk (two hours for a deer). Gut shot animals will die. They will also run, if pursued too soon. In 2005 I shot a bull with a bow and made a high gut shot. There was no blood trail. I tracked him through damp grass. Then, from a distance, I watched him lying there looking around for three hours. I refused the temptation to move close enough for another shot. I decided to walk back to my truck and prepared for the haul. When I went back six hours after the shot, he was dead where I had left him. Be very slow and careful in tracking an elk that is shot in a leg. The blood from a muscle wound will be bright red. If you will let that animal just lie down, the leg will probably get stiff. However, it might get up and move on its own after awhile, if a bone isn’t broken. 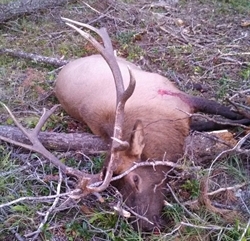 Muscle wounded elk are often not retrieved by the hunter, unless a bone is busted. The photo above of a great blood trail that diminished into a few very hard to find single drops of blood, then nothing. The young hunter had experienced help trying to track "his" elk, but the trail went completely cold. No more blood. The elk appeared to have been strong enough to just keep going. Expensive premium ammo like Federal Premium or Hornady Light Magnum or Heavy Magnum (my personal choices), and others give you the best opportunity to make your shot a fatal one, even if the aim goes wrong. Elk can and do heal from some muscle wounds, especially if the bullet was not high powered enough to do maximum damage. Massive damage provides good blood trailing and a quicker death. Very sharp fixed blade broadheads will have a good effect as well, causing massive bleeding and better blood trailing. Most are very sharp right out of the package, but can soon dull once they are in the quiver. Replace or sharpen them to “shaving sharp” often. We are still not willing to use mechanical broadheads on elk. The jury is still out for us, even for the newest generation that promise to open unfailingly. I once followed someone else's abandoned blood trail high up into horribly dense dead fall. Blood tracking was easy at first, but later became nothing but drops of clear serum in the snow, then nothing. I noticed that the elk was dragging one hoof at first, but eventually started to put more and more weight on that wounded leg until it was walking normally. The shooter had no way of knowing that, because he did not follow up his shot. If the elk (or other big game animal) disappears from sight, stand there for a moment and rehearse what just happened in your mind. Don’t be discouraged. Many people assume they missed as they watch their intended target disappear as though unhurt into the forest, or over a rise. They are usually wrong! Don’t jump to conclusions. In order to watch the fleeing animal as long as possible after the shot, step to the side or move slightly ahead, only as much as necessary. Then, just stand where you are and process everything. Mark the time or start a stop watch. Give it at least a half hour before pursuing it. Don’t rush to check that “last seen” spot until you’re sure the animal is nowhere near. It’s hard to see a lying down animal in tall grass or undergrowth. It could be closer than you think. After you’ve marked the three key points above, remain patient. Mark crucial spots on your GPS unit, if you have one. Watch the clock. Don’t rush. You’ve still got plenty to do. Slowly and carefully study the ground, grass or shrubs along the route the elk took from where it was hit, to where it disappeared. Be careful not to approach where it could be down until plenty of time has gone by. Look for any hair, blood or tracks. If there are clear tracks, note the condition of the tracks themselves. Notice how sharp the edges are, what color the upturned dirt is, or the overturned snow, compared to that around it. Try to memorize the size, shape and appearance of the tracks. They might mix in later with other tracks. You might have to distinguish which is your animal’s hoof print. That can get frustrating. After the elk slows done a little, the tracks will not tear up the ground as much. That’s a good sign that your animal has slowed down, but you might begin to wonder if it is another elk’s track. Note the freshness in comparison with what you’ve seen so far. After the crucial wait time has past, begin moving slowly along the trail past the point of last sighting. Study it carefully. Get down low to the ground and look for clues. Sometimes you might only find tiny drops of blood, one at a time. It’s not uncommon to see lots of blood quite a few yards away from the point it was hit, only to have the blood trail dwindle to nearly nothing. Again, don’t be discouraged. The exterior wounds sometimes get plugged up and blood just builds up inside. The tiny drops are from the blood that is still dripping off the hide of the animal. This does not mean the elk is not bleeding internally. Look along the stems of tall blades of grass and other off the ground flora for smears of blood that wipe on them directly from the animal's body. If someone is with you, have them walk off of the trail and use optics to look ahead for the elk while you are looking for blood and tracks (or vice-verse, depending on your skills). 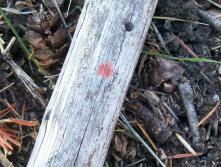 You might find blood in several spots along the trail, and then maybe none for a while. Look for tracks, disheveled earth, snow or vegetation. Look ahead occasionally and the path of least resistance might be somewhat obvious. Often times the animal will lie down and then get back up, upon seeing or hearing the hunter coming. 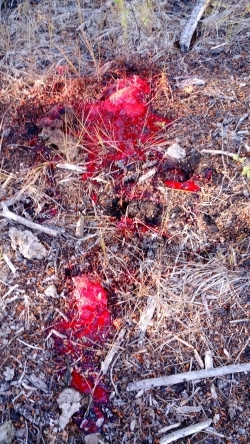 If you find a point where the elk lied down and bled, but got up and moved, stop and give it another 30 minutes or so. Is it a gut shot? If it could be, let it alone for several hours. Mark sign as you go along with bright flagging strips. (Please remove those later!) Look back often and the travel direction might become clearer from the general direction of your flagging. Hopefully you will not have to look long, but keep it up until you find the animal, or are absolutely sure you have no other choice but to give up. If night falls, it might seem best to come back in the morning, but time and temperature could destroy your meat. Here is a true story about a friend of mine who lost all of his meat because of several poor decisions. Click here to read the true story. 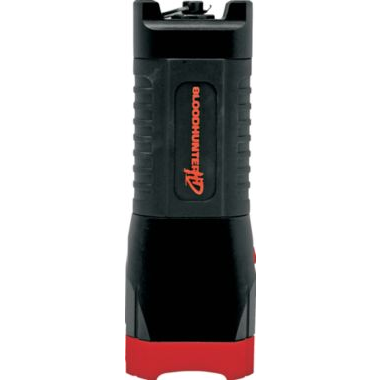 The best flashlight to have for night trailing is one of those made for blood trailing. It definitely makes blood trails jump out at you. Primos makes one called the " BloodHunter ". You can also buy a filter for your SureFire flashlight to do the same thing. SureFire flashlights are great pieces of equipment. Blood trailing at night is sometimes necessary, but not all that fun. Waiting until morning will assure your sign will look old and may disappear if it snows, rains or blows. Your meat may not stay cool enough. Keep this in mind if you hunt late in the afternoon. Once you pull the trigger or release the arrow you have the responsibility to do the blood trailing diligently and thoroughly, no matter how difficult or time consuming it becomes. Don’t take the shot unless you’re prepared to do whatever is necessary to get your meat safely in the freezer. We owe that to these fine animals. 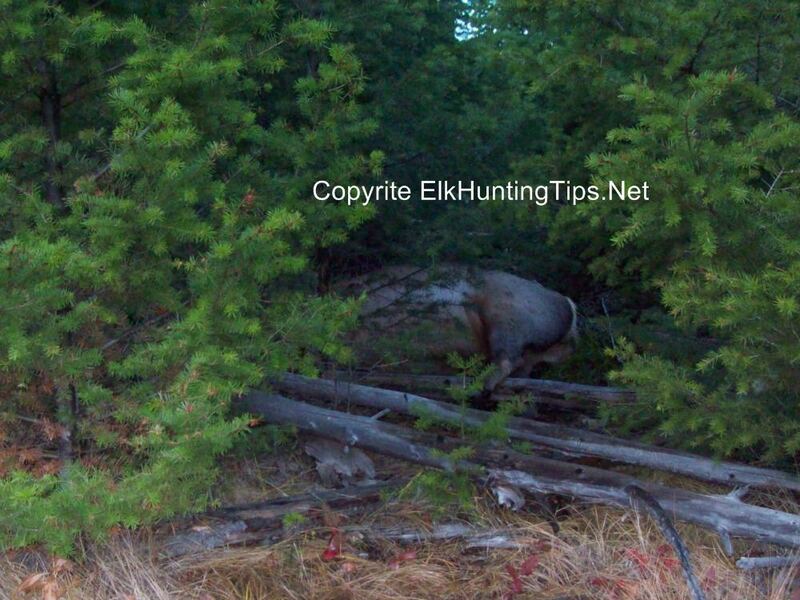 To read thorough instructions for field dressing an elk click here. 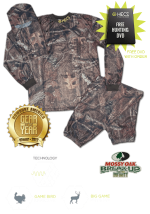 Even if you've done it many times, you might find a good idea or two that we have gleaned from several experienced hunters. Back to Elk Down! page, from Blood Trailing page.